The premise was a program – executed in three simulator centers including PMI, MITAGS and STAR Center – was to provide a uniform assessment program for captains. “There was no program that assesses our captains, so we created this environment within the simulator which is very controlled: 45 minutes at the bridge of a boat and it is a pressure cooker, presenting the captain with 22 decision points,” Crowley said. It took 22 months to run all 630 captains through the program, and there was a simple ‘pass / fail’ determination at the end. After the fi rst run through, there was a 72% successful com- pletion rate. Those needing additional training were provided classes targeting their skill gaps, and were then reassessed. It could be argued that the maritime industry is in a wa- tershed period, with an aging and rapidly changing employee base, a radical shift in the level and amount of new technolo- gies on board vessels of all shape and size, onerous new reg- ulation on emissions from ships and boats and a foundation change of the business itself, powered by vast new amounts of oil and gas coming from domestic sources. Amidst all of that change, the Crowley name today remains a cornerstone. 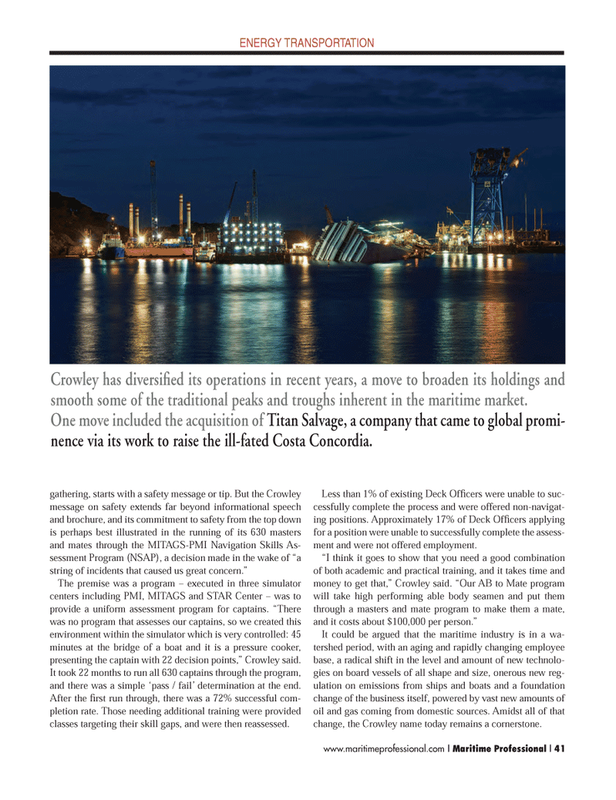 Crowley has diversifi ed its operations in recent years, a move to broaden its holdings and smooth some of the traditional peaks and troughs inherent in the maritime market. One move included the acquisition of Titan Salvage, a company that came to global promi- nence via its work to raise the ill-fated Costa Concordia.